simplecall has one goal, and that is to provide affordable and easy international calling to people calling Bangladesh. This is why simplecall brings you a unique and revolutionary cheap calling service to call Bangladesh where calls start from just 4.5¢ /min to landlines and mobiles. The major advantage of using simplecall is that it is a PINless service, which means you don’t have to enter complicated PIN number or card code. All you need to do is just dial from your landline, mobile or even your PC and start making phone calls, effortlessly. You can also store your most-called destination number, and once it is saved, you can call that number with the press of a button. simplecall believes in transparency and this is why all our rates are advertised on our website. Unlike what many cheap call providers claim, simplecall will never charge you more than the rate we advertise - you only pay for what you use and nothing more! 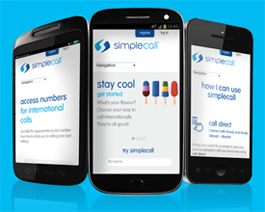 To start enjoying the benefits of cheap international calling, please register at www.simplecall.com and start calling your friends and families. Currently, more than 200,000 Bangladeshis live in the USA and we know Bangladeshis maintain a strong family bond and love to speak to their families and friends back home. simplecall is offering a cheap calling card for Bangladesh. This is an international calling card service through which you can call anywhere in the world. We give you a chance to be at the heart of the action with an affordable and low cost phone call.